New York-New York uses the New York City influence of its name in several ways. Its architecture is meant to evoke the New York City skyline; the hotel includes several towers configured to resemble New York City towers such as the Empire State Building and the Chrysler Building. In front of the property is a lake representing New York Harbor, with a 150-foot-tall (46 m) replica of the Statue of Liberty, and replicas of the Soldiers and Sailors Monument, the Whitney Museum of American Art, the Main Immigration Building on Ellis Island, and the Grand Central Terminal. Within the resort, particular gambling areas, lounges, restaurants, and meeting rooms are named after New York City neighborhoods or landmarks. The main casino area, for example, is named after Central Park, while the shops are modeled after Greenwich Village. The resort is located on the northwest corner of the Tropicana – Las Vegas Boulevard intersection. At street level, pedestrians are blocked from crossing by concrete barriers. 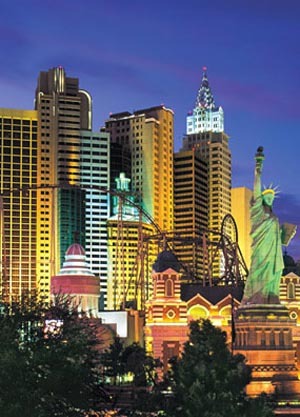 Instead, New York-New York is linked by overhead pedestrian bridges to its neighboring casinos to the south (the Excalibur, across Tropicana Avenue) and to the east (the MGM Grand, across the Strip). The hotel also features nearly a dozen bars and nightclubs, catering to a largely youthful demographic, including ROK Vegas, Nine Fine Irishmen, Coyote Ugly, Pour 24, the Central Park Piano Bar, and the Center Bar, the latter of which is located in the center of the main casino floor. On weekend evenings, the casino also features a live DJ and go-go dancers performing on an elevated stage within one of the table game pits, known as the “Party Pit”. Casino: Yes, 84,000 square feet. Casino games include Blackjack, Craps, Roulette, Mini Baccarat, Pai Gow Poker, Caribbean Stud Poker, Let It Ride, Big Six, Casino War and Keno. More than 2,000 slot machines including Wheel of Fortune, Monopoly, Megabucks, Jeopardy, Slotopoly, Blazing 7’s Dollars, Empire Slots, Elvis and Moneytime. Race & Sports Book: Yes, a 40-seat race and sports book, equipped with 45 televisions and 24 big screens. Restaurants: New York-New York has the following dining options: America, Broadway Burger Bar, Chin Chin Café, Nathan’s Famous Hot Dogs, Gallagher’s Steakhouse, Gonzalez y Gonzalez, Il Fornaio, New York Pizzeria, Nine Fine Irishmen, The Sporting House Bar & Grill and the Village Eateries, which offers a variety of smaller food venues. Entertainment: Entertainment includes the revealing Cirque du Soleil show Zumanity, Dueling Pianos at the Bar at Times Square and live entertainment in the lounges. Nightlife: Rok Vegas nightclub and Coyote Ugly bar. Attractions: Yes, The Roller Coaster at New York-New York. Shops: It’Sugar, Cashman’s Photo Magic, Regis Signature Salon, Houdini’s Magic Shop, I Love NY-NY Signature Shop, Manhattan Express Photo, Stadium Snacks, The NewsStand, Vegas Express, Las Vegas Harley-Davidson, Grand Central Bling Company; and the Soho Village, which provides an array of New York-themed fashions and gifts. Convention Rooms: Yes, more than 21,000 square feet of meeting and banquet space. In-Room Internet Access: All rooms have Web TV. Hotel Amenities: Coney Island-style area with games and video arcade, concierge, currency exchange, laundry, luggage and maid service, room service, wake-up call, safety deposit box. Parking Garage: Yes, a nine-story parking garage. Standard Room Amenities: Air conditioning, alarm clock/radio, remote-controlled cable TV, hair dryer, iron and ironing board (on request), in-room safe, desk, electronic door locks, refrigerator (on request and there is an additional charge), web TV, on-command and pay-per-view movies, telephone, voice mail. Incidental Charges: Hotel requires a credit card, cash or a debit card for incidental charges. The hotel charges a daily resort fee of $15 plus tax, which covers the cost of the following hotel services: in-room high speed internet, unlimited local and 800-number calls (domestic long distance phone calls will incur an additional charge of $0.10 per minute), boarding pass printing, notary services, and incoming/outgoing faxes (limit 5 pages), Fitness Center access and daily newspaper.